The pilgrim traveling to Santiago de Compostela during the Middle Ages not only encountered physical hazards but faced bandits and exploitation by dishonest local residents. During the 12th century the Knights of Santiago, one of the most noble orders of Europe, took charge of protecting pilgrims along the road while at the same time fighting the Moors and serving the king. The archbishop of Santiago de Compostela, impressed by their good works, made their leader an honorary canon of the cathedral. 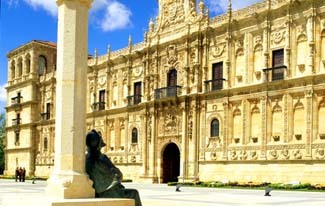 Originally headquartered in Cáceres, the knights relocated to León and founded the hospice of San Marcos. The original building was razed in the 16th century by order of Ferdinand the Catholic, who planned a magnificent edifice worthy of the fame and wealth of the heroic Knights of Santiago after the reconquest. His pledge was finally realized by his grandson, Charles V, who commissioned the architect that created El Escorial, just north of Madrid. Through the years this glorious building served as a military barracks, a military prison, a veterinary college, and even as a stables. Guest rooms are in three different areas: in the main building and towers, “cells” in the old section of the building, and in a newer wing with modern decor. With 226 rooms in this hotel don’t expect the intimacy of some of the smaller paradors. In the summer of 2006 I walked from France to Santiago de Compostela on the Camino de Santiago. I trudged into this hotel (after all it began life as a pilgrim’s hostel, and it was here I first heard about the pilgrimage trail in the 1980s) hot and sweaty with backpack on, and was met with courtesy and even given a “pilgrim’s” discount. Upon escorting me to my room, I was told I would enjoy watching the other pilgrims walk by early in the morning. I feasted on the massive breakfast and soon joined them. After all, I had over 300 km to go (180 miles). In front of the hotel, you’ll see a great statue of a pilgrim, slumped in a sitting position and utterly exhausted. It’s about how you feel at times! That said, the gorgeous façade and public areas in the hotel have plenty of ambiance. The rooms definitely don’t have the same feel, although they’re perfectly comfortable. Rooms in the older section have a little more atmosphere. León is well served by train and bus. To reach the hotel, go to the town center. Next to the Bernesga River is a roundabout with a fountain in the middle. A signpost directs you north along the river to the hotel. This outstanding Renaissance building ranks as León’s third most popular tourist site after the cathedral and the Basilica of St. Isidore. The parador’s Plateresque façade measures 328 feet long and 2 stories high. The friezes, columns, and pilasters are amazing. Medallions in relief depict famous personalities from the Bible and Roman and Spanish history. Events from the life of St. James, (including his legendary slaying of 1000s of Moors) are depicted in Baroque ornamentation over the main entrance. The lobby is like a small museum with carvings, tapestries, and paintings hung beneath a 16th-century vaulted ceiling. The hotel’s public rooms are furnished with both antiques and reproductions. Cloisters standing two stories high surround a courtyard garden planted with ivy, shrubs, and trees. Some guest rooms have four-poster beds and views of the cloisters; others have views of the parking lot. But any room allows you to relive history in an indulgent manner undreamed of by any pilgrim trudging across Spain to Santiago de Compostela. An elegant dining room looks out on the river. The castle’s parade ground is used for theatrical, dance, and zarzuela performances during the summer months.